SERVPRO is a national restoration powerhouse for good reason. Decades of experience and hard work have resulted in SERVPRO being the most trusted brand in the industry. 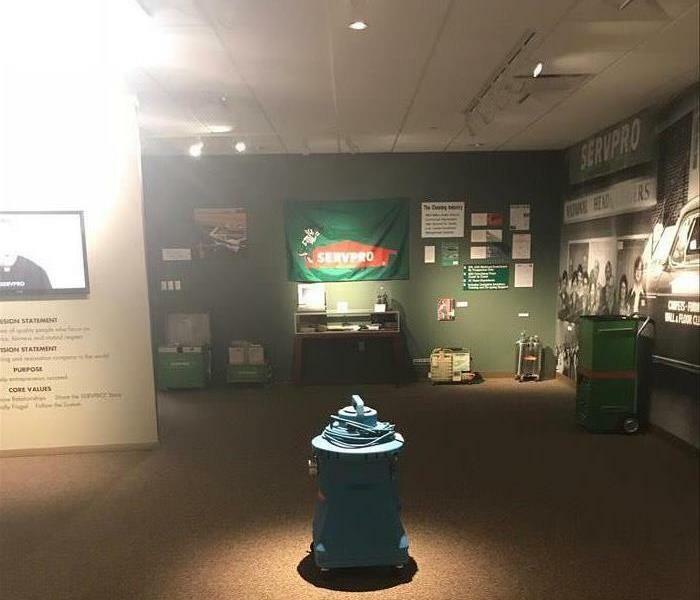 Here is a gimps into the SERVPRO museum down in Tennessee which is home to many stories and classic equipment. We take a lot of pride in our companies rich history and hold ourselves to the highest standards here at SERVPRO of Shrewsbury/Westborough. 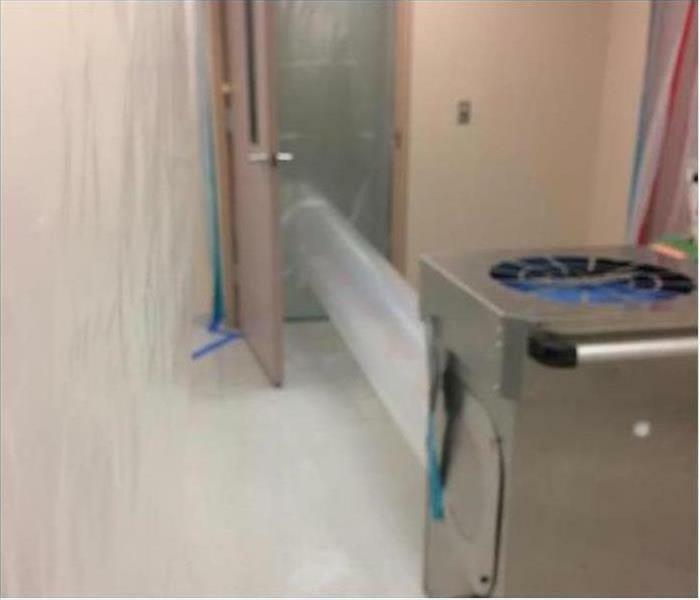 Ever see a document drying chamber before? You have now! 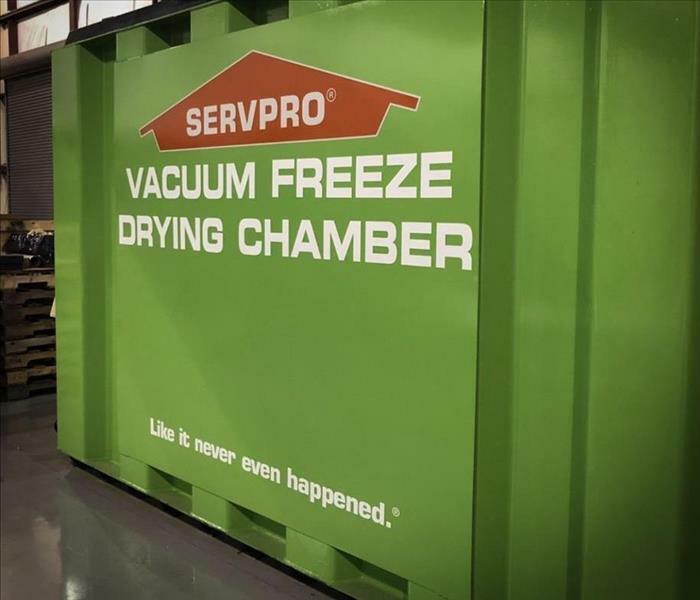 Yet another way SERVPRO separates our self as the most trusted name in restoration. We own and operate our own Document Restoration equipment down at our corporate headquarters in Tennessee. Have critical documents of yours been damaged in a fire or a flood, call the experts today. SERVPRO of Shrewsbury/Westborough. We will suit up for you! Here at SERVPRO of Shrewsbury/Westborough we always wear our Sunday best to suit your needs! Check out our Crew Chief Miguel suited up and knocking down soot caused by a garage fire with our dry ice blaster! This fire damage in Upton, MA never stood a chance with Miguel on the job. Got fire damage? Call the crew with the best suits in town, SERVPRO of Shrewsbury/Westborough! Here at SERVPRO of Shrewsbury/Westborough we take a lot of pride in interacting with our community. Here is a good one from last years winter ball put on by the Corridor 9/495 Chamber of Commerce. Say cheese Sean and David!! 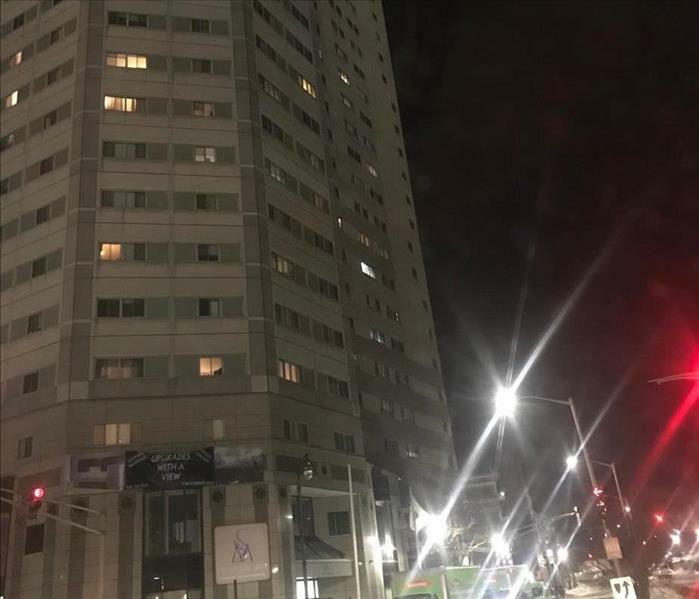 No Building to Big or to Small! Why SERVPRO? Because we handle each phone call that comes in with the same urgency and care! 20+ Story commercial high rise, we will be there. Water heater springs a small leak in your home, we will be there. Our skills are as versatile as our customers needs. Call us today, no job is to big or to small. 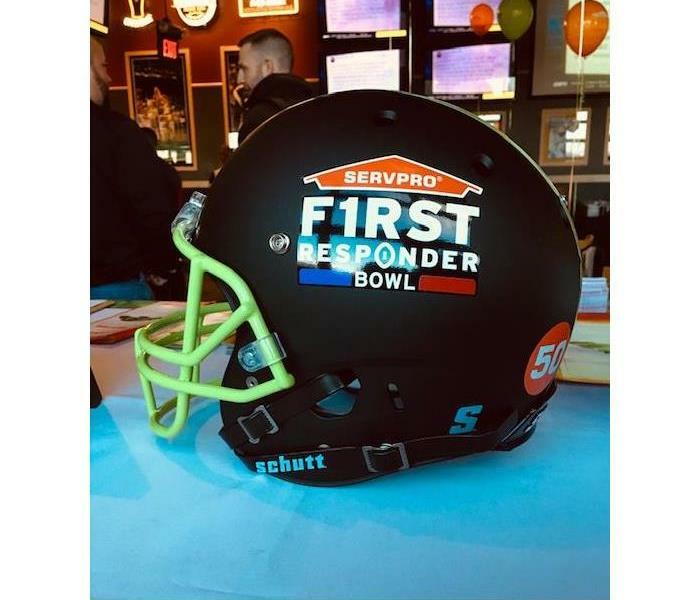 We had the pleasure of sponsoring our first ever College Bowl game this past December, the SERVPRO First Responder Bowl! We proudly hosted area First Responders and their families at the local Buffalo Wild Wings in Shrewsbury, MA for a private watch party. What a great time had by all, already looking forward to next year! The picture above shows fire damage to a master bedroom, SERVPRO of Shrewsbury / Westborough mediated the fire, smoke, and soot damage. We have trained professionals that get in and get the job done quickly and efficiently. Our next step is to let our amazing Rebuild department come in and finish this master bedroom to the customer’s satisfaction. 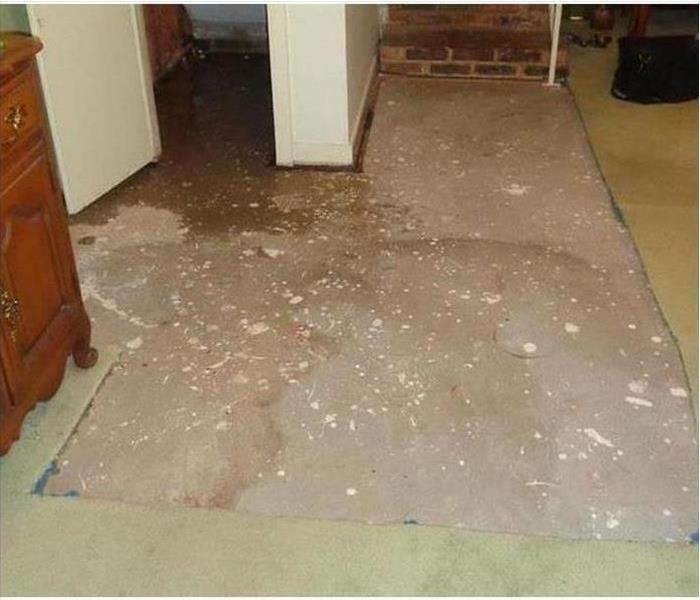 Call the Professionals to fix all your remediation needs at (508) 757-7885. As you can see in the picture above water spots have been creating due to a small faulty pipe leak. 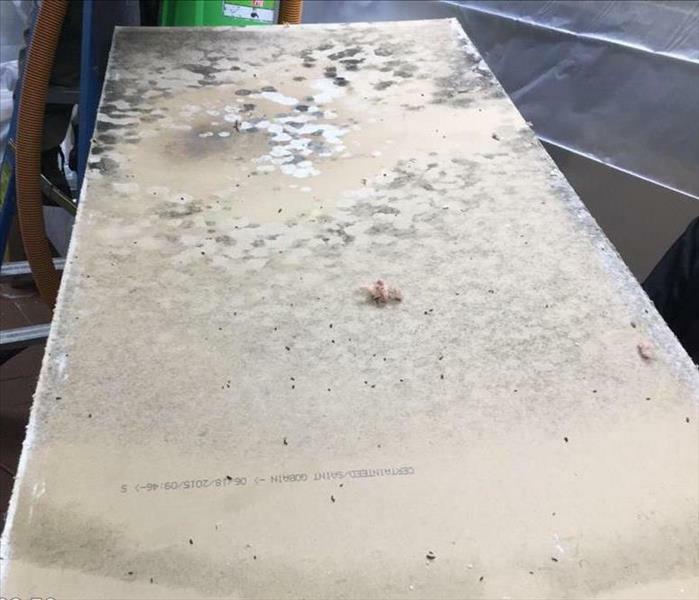 SERVPRO of Shrewsbury / Westborough got in to re-mediate all the water damage that was caused, first step is to dry out all the affected area which allows any mold growth spores to diminish. After the mediation we cut out all the ceiling and instillation affected with water spots, rebuild came in to finish and make the garage look brand new. 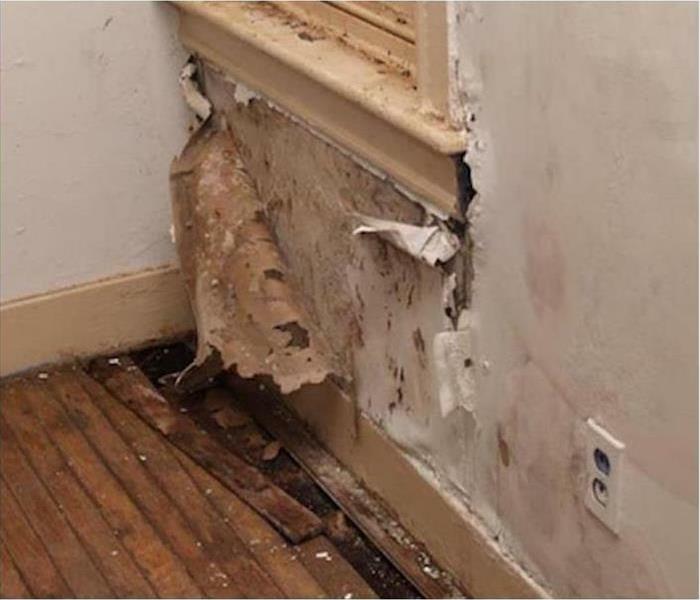 Any water damage needs to be re-mediated call the professionals at (508) 757-7885. 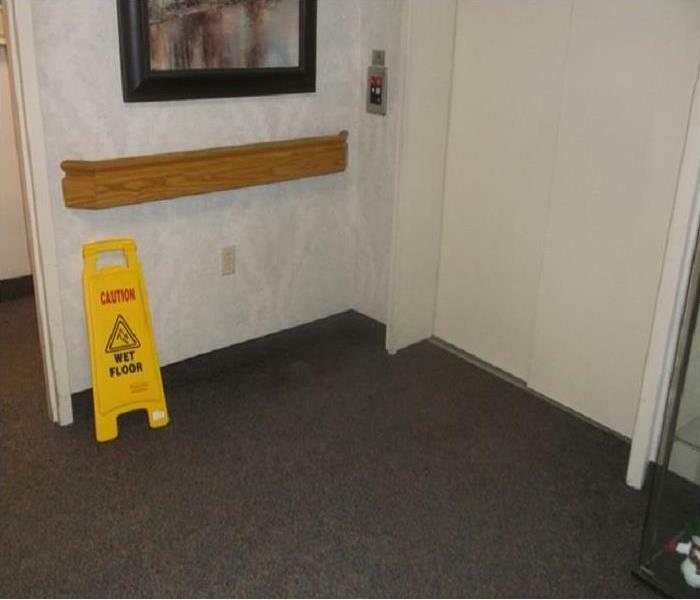 Water damage isn’t always visible. The picture above shows hard wood floor buckling due to excess water getting under the floor boards and causing the wood to shift. 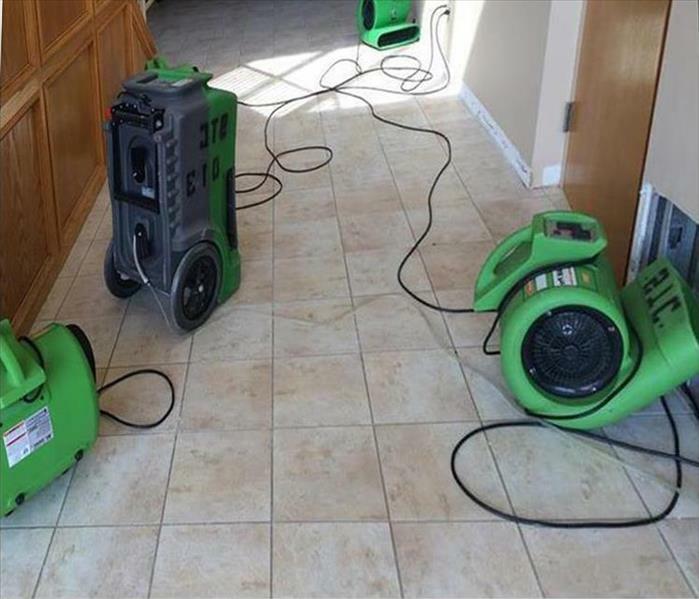 SERVPRO of Shrewsbury / Westborough set up dehumidifiers and air blowers to get all the excess moisture out of the air, and took out all the buckling wood flooring to have it replaced. SERVPRO can fix any water damage big or small call us today (508) 757-7885. Fire damage to your home can be devastating, SERVPRO can fight all three damages that come with a house fire. 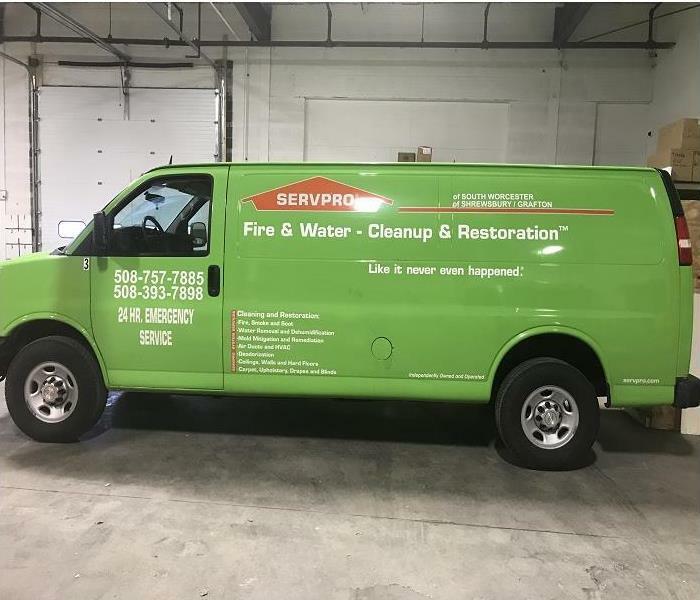 Fire, water, and soot damage SERVPRO of Shrewsbury / Westborough if fully trained, and equipped with the right materials to make fire damage disappear. Call us now for all your mediation needs (508) 757-7885. 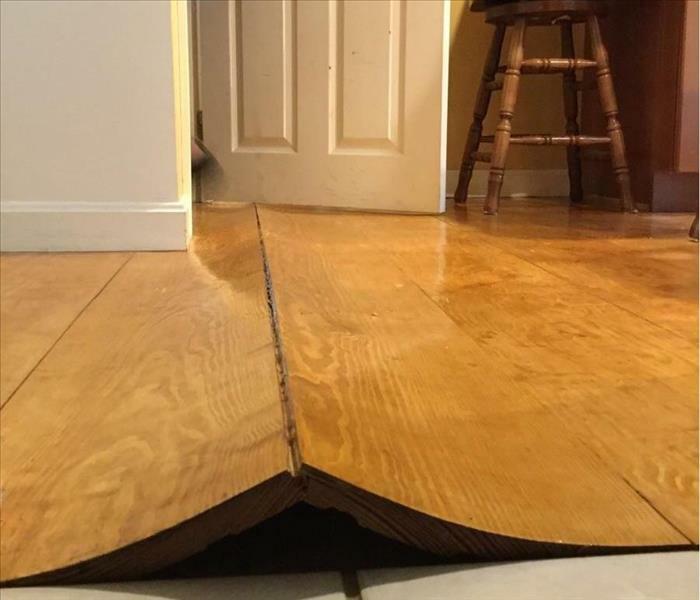 Floods in Massachusetts can be brutal, take a look at this home, water seeped in under their front door overnight and caused a big mess. This picture shows after we remediated all the water and we are drying out the area. SERVPRO of Shrewsbury/Westborough is capable and ready for all your storm damage needs, call us at (508) 757-7885. 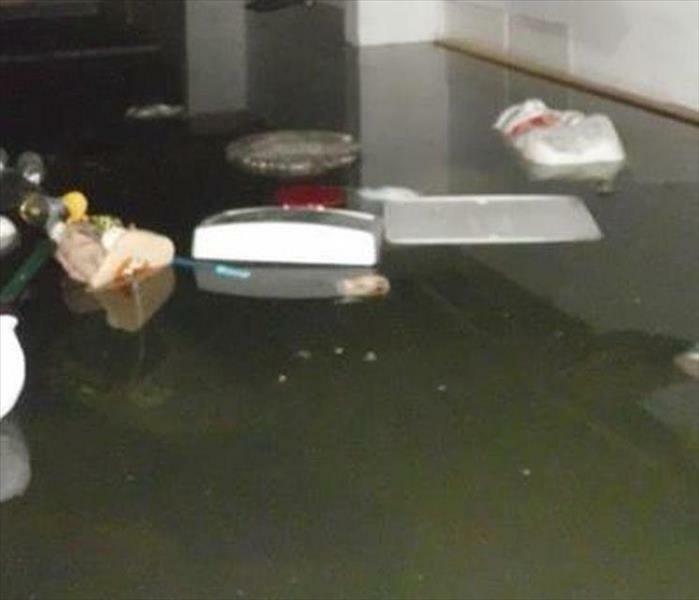 This picture is of a home gym flooded with water from a faulty pipe leak from the master bathroom above. The best way to re-mediate water damages like this is to stop the source of damage, follow through with suctioning out all standing water. Next you will want to expose the rug by lifting it up, and placing an air mover to have proper air circulation to dry out the rug. After that is set up you should put down dehumidifiers to dry the air and get rid of any extra moisture. SERVPRO of Shrewsbury/Westborough is clean and professional with all remediation services. Call us today (508) 757-7885. 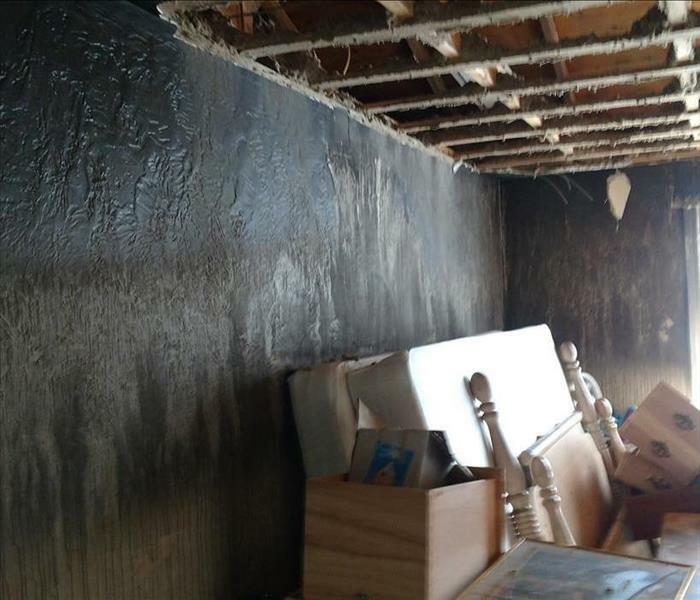 Fire damage is real, but luckily they called SERVPRO of Shrewsbury/Westborough, we came quickly after the fire was put out to remediate the water so no more damage could have occurred. 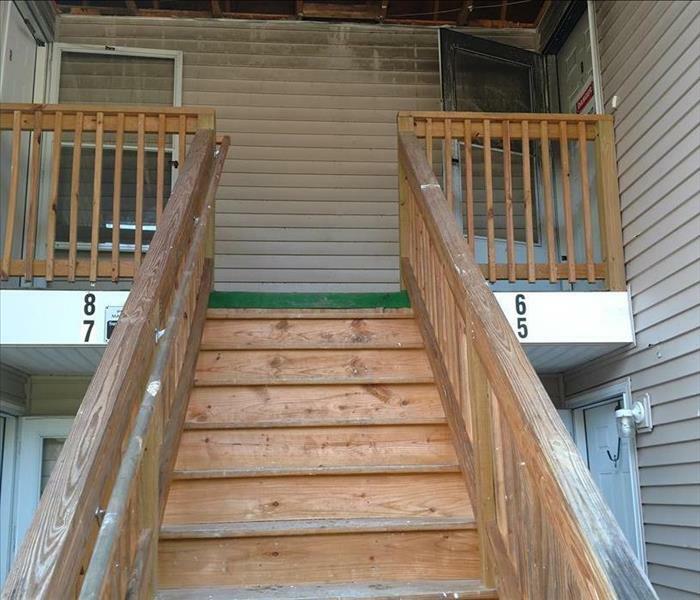 After that we met and made a plan to remediate all the fire, smoke, and soot damage from these apartments. 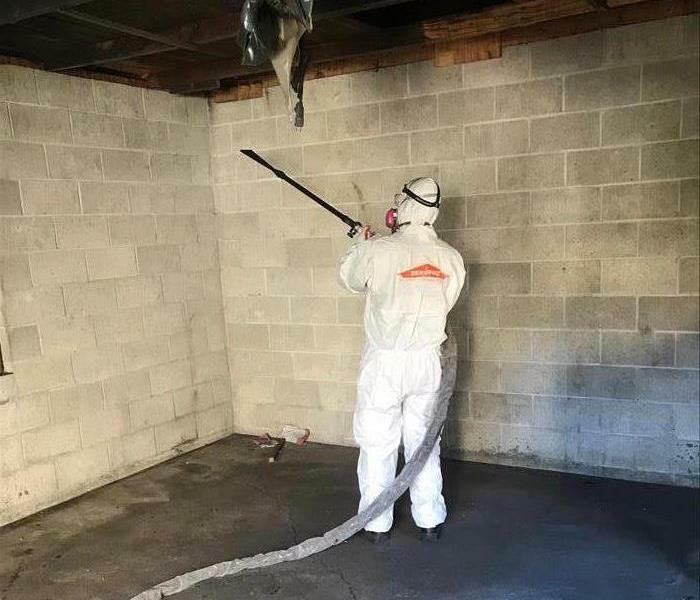 Commercial remediation jobs can be difficult but nothing SERVPRO could handle. Call us at (508) 757-7885. In this local home, water damage was in this finished home entertainment room. 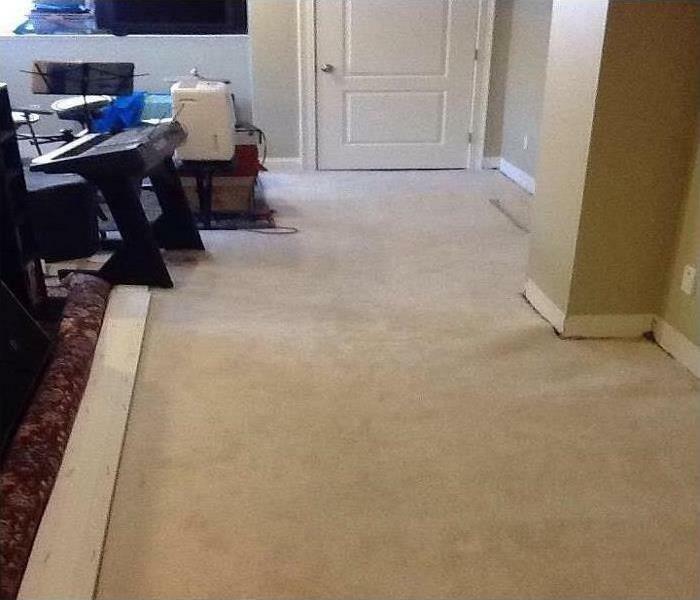 In the picture above you can see water damage under the rug and padding. The rug was ripped up because of possible mold growth. SERVPRO arrived within the hour and remediated all the mold growth that was starting, along with suctioning all the water and drying out the baseboards and drywall. 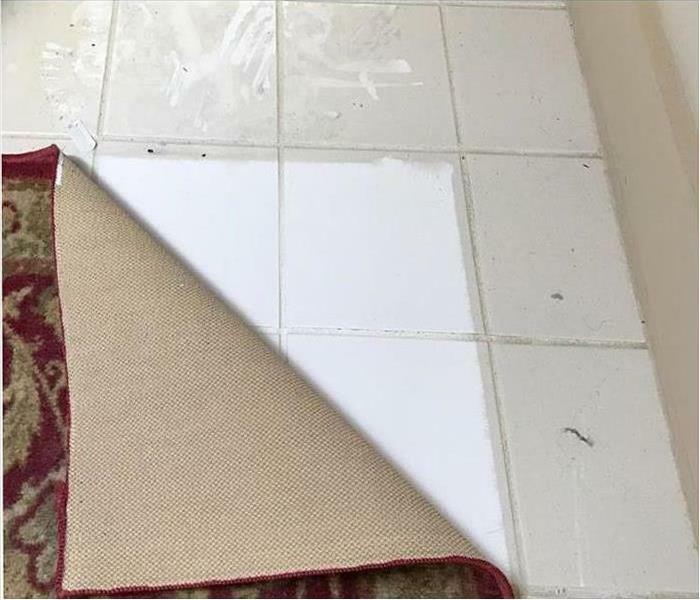 SERVPRO of Shrewsbury / Westborough did everything we could, we even replaces the old rugs and baseboards! Save to say the space was saved just in time for the super bowl. Local church had a faulty sprinkler system in their kitchen, and caused a lot of water damage. Above is a picture after SERVPRO of Shrewbury / Westborough came in to access the damage, clean out all water, and damage. Then rebuild came in to insert cabinetry to the customer’s satisfaction. Quickly drying water which has seeped into walls at your home or business is essential to proper mitigation. Our professionally certified SERVPRO technicians are highly trained and skilled to quickly understand the extent of your water damage. In this particular office they set up containment using 6mm poly sheeting to reduce the room’s volume and expedite the mitigation time. Our technicians used tools (like the dehumidifier pictured) to regulate and monitor conditions. After only one day, SERVPRO of Shrewsbury/Westborough was able to restore this room to preloss conditions. We are happy this local Shrewsbury office leaned on us in their time of need! Call SERVPRO of Shrewsbury / Westborough the next time your place of business suffers a water loss, no job is too big or to small (508)757-7885. 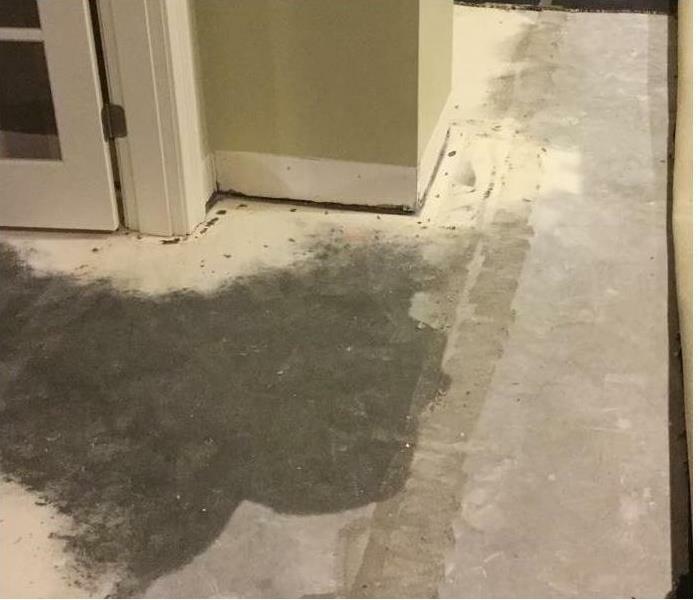 This Commercial water damage was the result of a ruptured water line. The incident occurred during the night allowing quite a lot of water to accumulate and fester in all the nooks and crannies of this office. When we got there, we quickly started to clean up the standing water, by suctioning all the standing water out of the affected areas , then setting up air blowers and dehumidifiers to dry out what was left. The photo shows the equipment that was used to finish up the water damage. 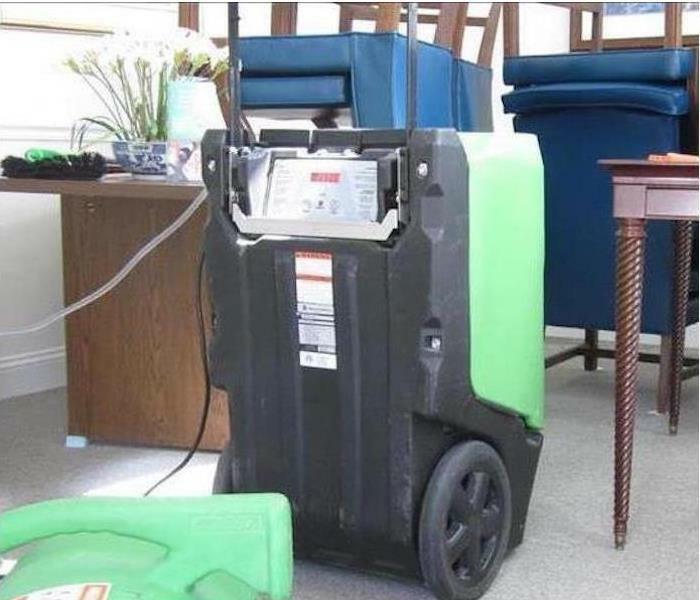 SERVPRO understands that running a business can be difficult, but don’t let water damage affect your business. Let us help you! Always call SERVPRO of Shrewsbury / Westborough with all your restoration needs at (508)757-7885. If you suspect mold in your Shrewsbury home, SERVPRO of Shrewsbury/Westborough can help. 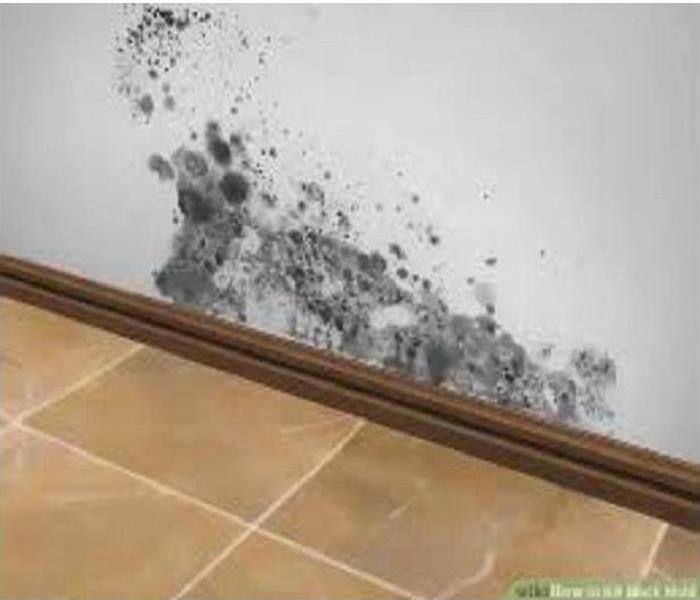 Mold can cause serious health risks to you and your family. SERVPRO professionals are trained in mold remediation and will thoroughly examine your home or business for mold. 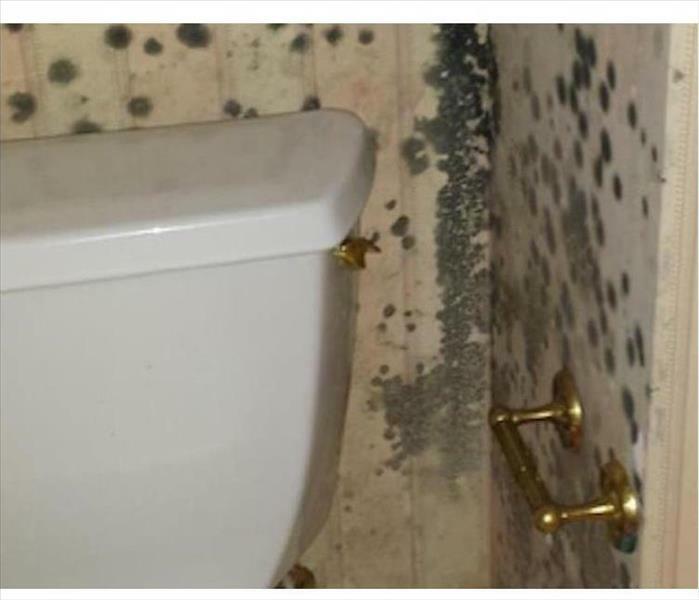 If mold is found SERVPRO will safely restore your property to pre-damaged condition. Call us at (508)757-7885. 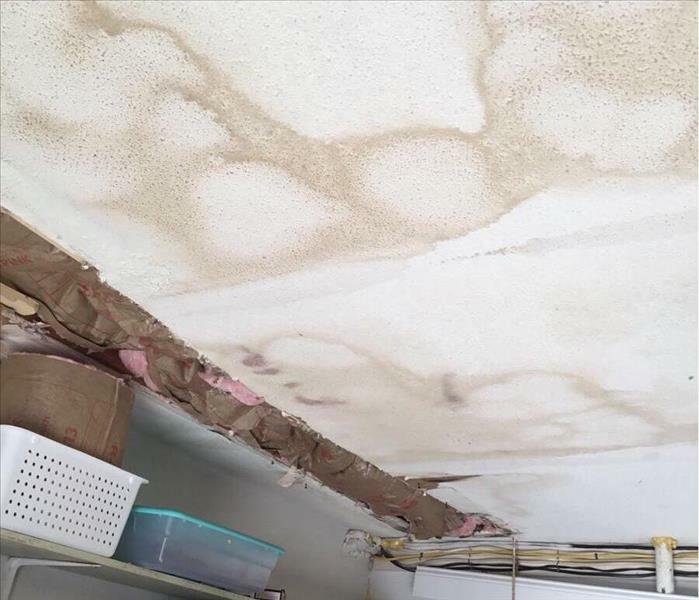 After a severe storm, a Westborough home owner experienced extensive water damage to their home gym. The owner called SERVPRO of Shrewsbury/Westborough and they and were quick to respond. SERVPRO was able to remove the water and restore the gym back to the original condition. The broken toilet tank left a large puddle of uncontaminated water in the bathroom and part of the master bedroom. 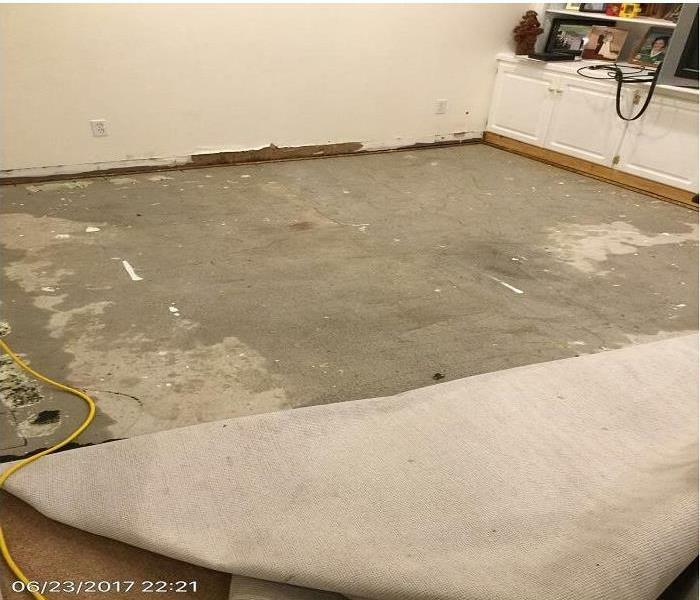 We removed the damaged carpet and dried out the concrete sub floor before new laminated flooring could be installed to the owner’s satisfaction. 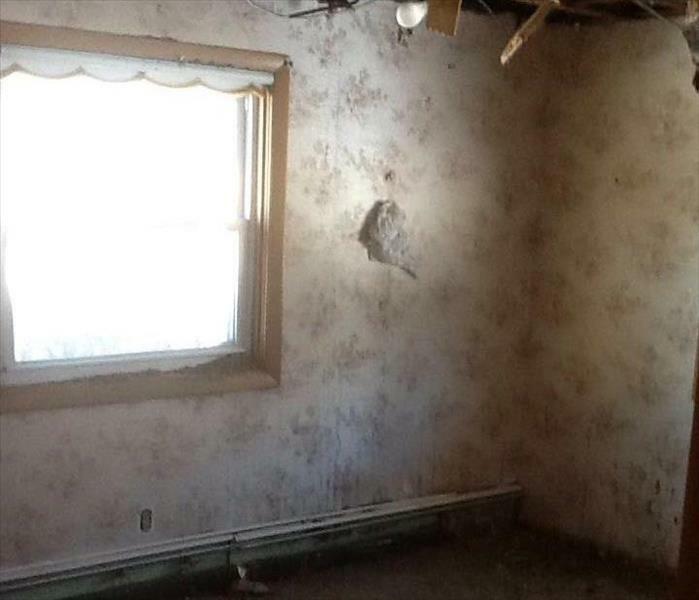 If your home is ever having any water damage issues, don’t be afraid to call us at (508)757-7885. 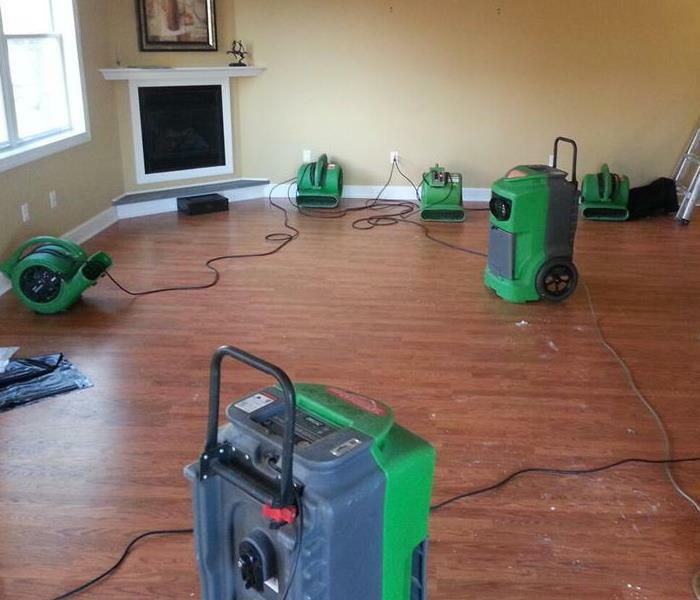 At SERVPRO of Shrewsbury/Westborough we are prepared for residential and commercial water damage. 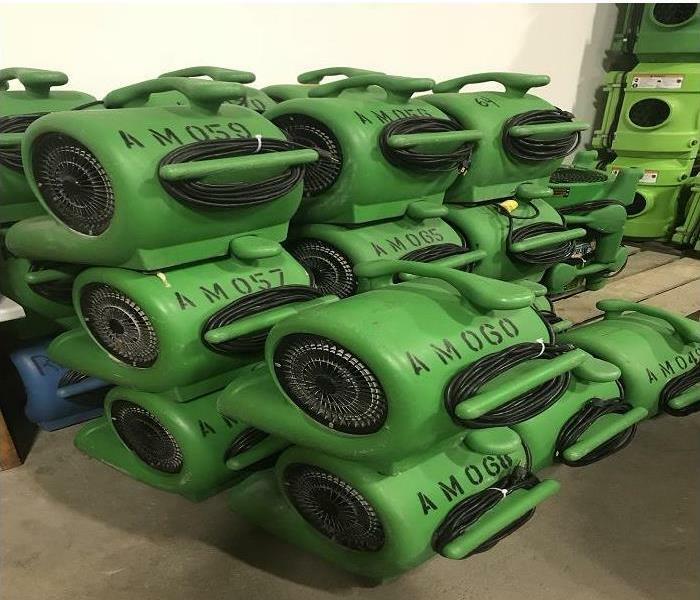 Our facility is stocked with air movers to dry out water from damaged areas. The air movers blow low to the ground at very high speeds, which forces water to quickly evaporate from carpets and floors. When a pipe burst at a nursing home in Shrewsbury, SERVPRO of Shrewsbury/Westborough responded quickly. The water spread rapidly throughout the first floor making it hazardous for the occupants. SERVPRO was able to extract and dry the carpet making the facility home again. 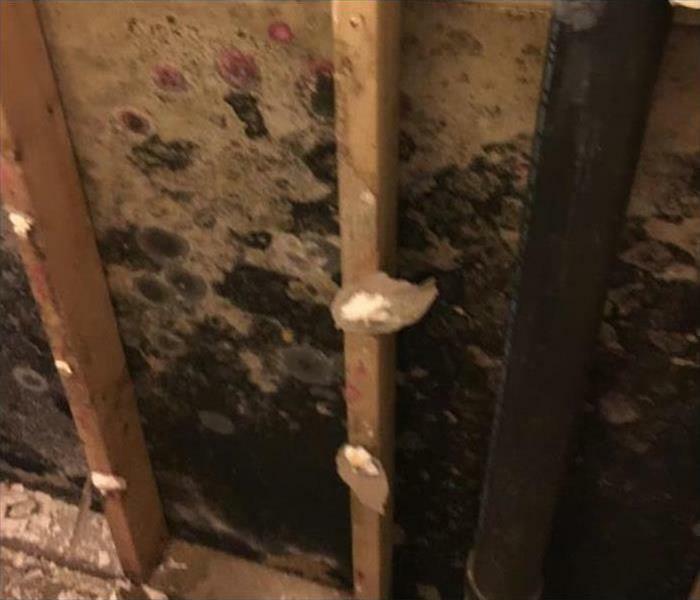 Basement Affected by Storm Flooding? If you have wet carpet, there’s no time to waste. Here are some tips that can help to prevent the spread of moisture and mildew. The easiest way to get the dampness out of your carpet is by eliminating the water with a wet vacuum. If the damage is extensive you will want to call SERVPRO. Pictured is a home in Shrewsbury that was damaged by torrential rain. 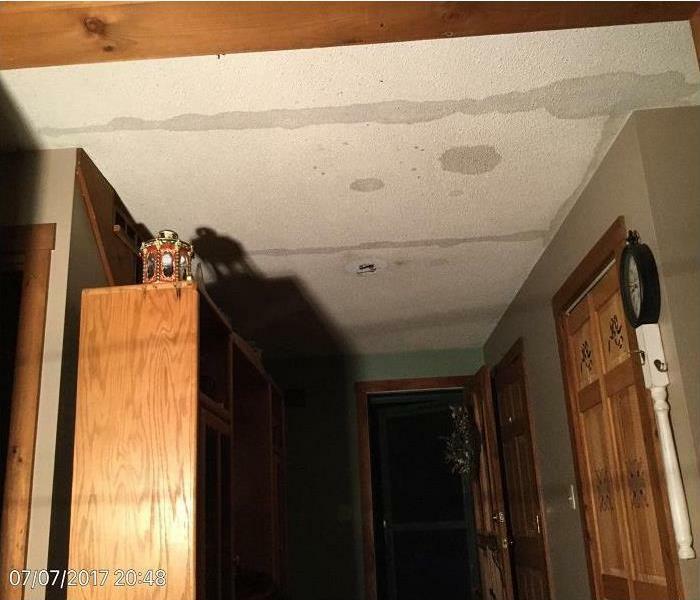 The rain leaked through the roof and heavily stained the ceiling. Fire damage to the kitchen of this Shrewsbury home left a heavy layer of soot and smoke damage behind. The before photo shows just how much as the carpet runner has been pulled back to contrast the floor without soot and smoke damage to the portion of the floor with soot and smoke damage. Water damage manifested itself at this Shrewsbury home when the PVC pipe in the photo cracked. 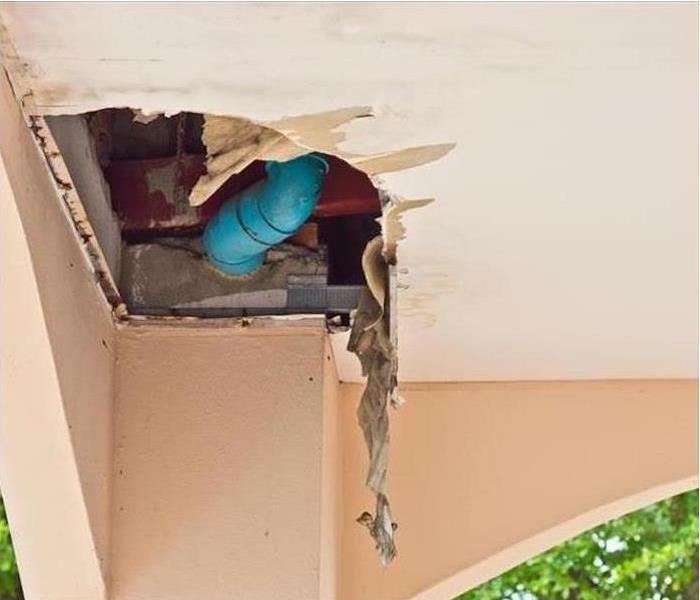 Over time water accumulated from the cracked pipe onto the outdoor ceiling. It eventually collapsed from the weight of the water. The groundwater entered this home in Shrewsbury and wetted the tile flooring and the trim of the walls and cabinets. Unfortunately, the water also wicked up a small section of drywall requiring a small demolition to discard the storm damaged gypsum panels. 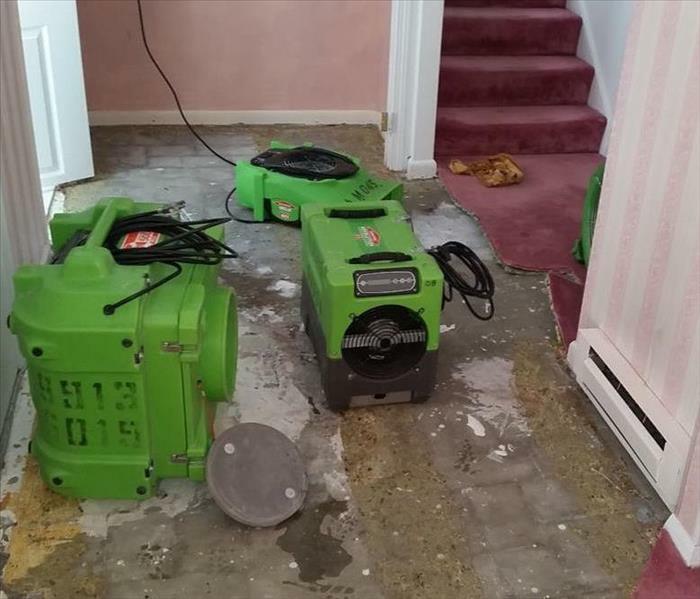 The SERVPRO drying devices are removing the last remnants of moisture as the treated area is edging closer to its preloss condition. The fire in the attic was put out quickly, but the damage was extensive, though the charring was limited. The cleanup involved removing the destroyed building elements including the insulation. Homeowners appreciate a fast return to pre-damage condition, and we strive to please our customers. Mold damage at this Shrewsbury home developed under a leaky window sill. The photo shows the damage to the wallboard and floor. 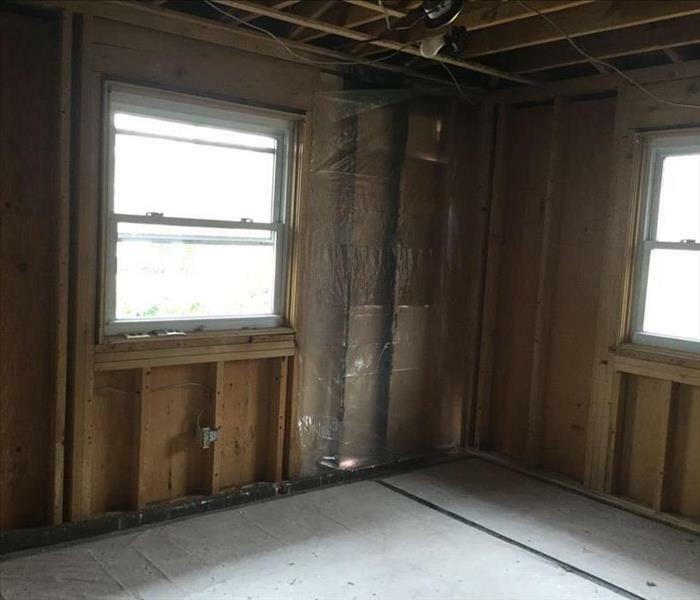 SERVPRO was contracted to tear out the mold damaged building elements and treat the mold infestation. We also replaced the damaged building materials. Our four man crew responded immediately to the sprinkler system malfunction at this church in West Boylston. We covered or moved the furnishings and fixtures to mitigate water damage. Shown is the demolition of non-salvageable walls in preparation for a rebuild. The water extraction was complete, and the dehumidifiers helped restore a normal RH level. Our SERVPRO crew worked hard and long to repair the church for services. This building took in a large quantity of groundwater water from a severe storm. The Black Water required safe and fast extraction to protect the property from secondary water damage and possible biohazardous difficulties. The final step was to spray an antimicrobial product on the entire storm affected area. This seldom used bathroom in Grafton succumbed to mold growth. Poor ventilation often leads to a moisture buildup resulting in a fungi patch. We used wet sponges and scraped away the topical growth (using a HEPA filtration vacuum to prevent cross contamination) and were able to apply an antifungal product to finish this job simply for the owners. 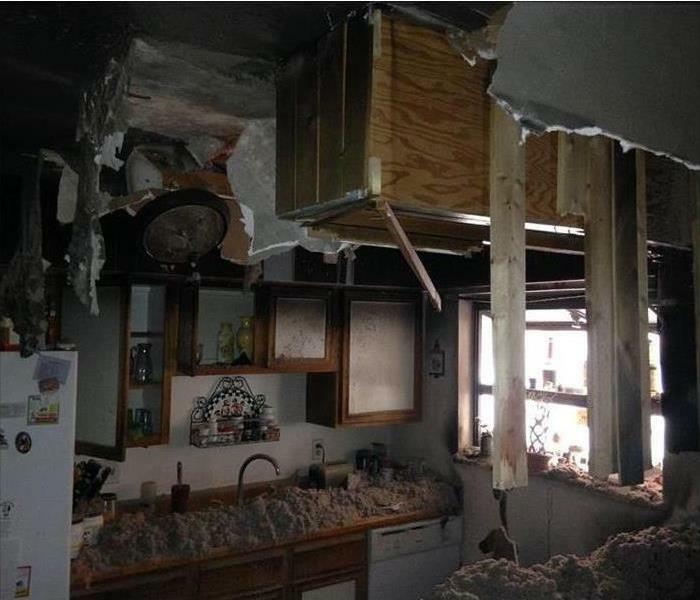 Fire damage in this Shrewsbury home began with a faulty electrical outlet. 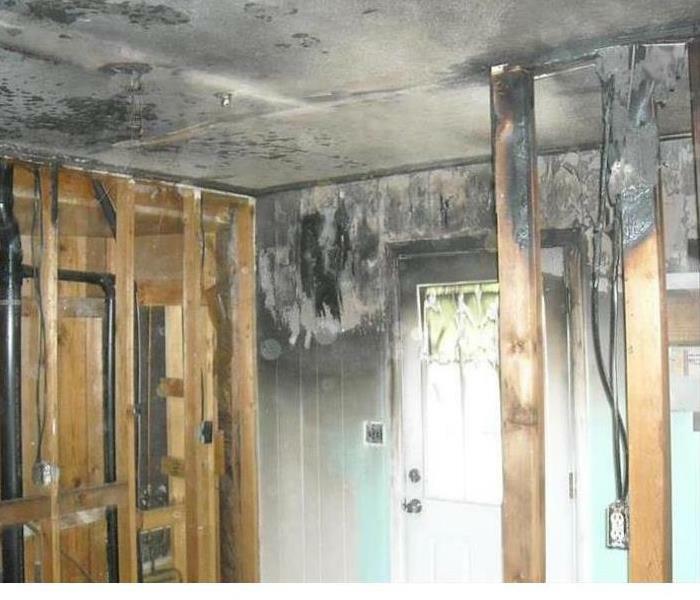 Before the fire was put out, it had created extensive damage to the drywall, the studs, and the front door. There was a great deal of soot and smoke damage to be cleaned up also. If fire damage impacts your home or commercial facility, call SERVPRO of Shrewsbury / Grafton 24/7 at (508) 393-7898. We proudly offer 24-hour emergency service.